Kappa mono and full-range, multi-channel amplifiers deliver the efficiency and power you expect from Class D amps—and the performance you expect from Infinity.. Each model in the lineup will accept both high-level or low-level inputs, allowing the JBL Stadium amplifiers to be added to virtually any car audio system, including factory installed systems. 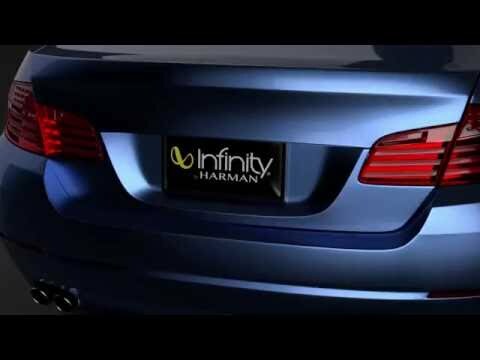 The 2-, 4- and 5-channel amplifiers offer Bluetooth® audio streaming, exclusive Clari-Fi™ music restoration technology that analyzes and improves the audio quality of compressed files in real time, a multi-pairing Party Mode that lets anyone in the car stream music, and a cabin-mounted control panel. Kappa amplifiers give you the power to shape your car audio experience in new ways. The three full-range, multi-channel Kappa amplifiers (K2, K4 and K5 models) feature Bluetooth® connectivity for wireless audio streaming from phones and other devices. You can receive phone calls through your car audio system, just by touching a button on an included control panel. Clari-Fi™, a proprietary DSP technology is incorporated in the K2, K4 and K5 amplifiers, analyzes music files and improves highly compressed digital music files in real time. A predictive algorithm restores audio content that is discarded in the compression process. Clari-Fi™ works with all playback devices and audio sources. It extends high-frequency bandwidth, restores the natural warmth of vocals and widens the sound stage. In short, Clari-Fi™ gives your digital music back its soul. The K2, K4 and K5 amplifiers offer Party Mode, a multi-pairing capability that enables Bluetooth® devices to stream audio individually. When Party Mode is selected from the cabin-mounted control panel, anyone in the car can drive the music. The K2, K4 and K5 multi-channel amps come with a wired control panel that incorporates an omni-directional microphone and puts a range of functions at your fingertips. You can activate Bluetooth® pairings, accept and end phone calls, select Party Mode and cancel Clari-Fi™. Every Kappa amplifier, including the full-range models, is a Class D. These high-efficiency, low-heat amps generate a lot of power without drawing much current, and feature small footprints. The full-range Kappa amplifiers (K2, K4 and K5) include full-range line outputs. This enables them to pass the audio signal to additional amps that power subwoofers, increasing your system configuration options. Kappa amplifiers incorporate a mini-USB port that enables you to easily upgrade firmware. Four-channel, priority inputs on the full-range Kappa amplifiers override the playing source when a signal is detected from Advanced Driver Assistance Systems. Kappa amps feature a subsonic filter in with variable frequency and Q. For sealed enclosures, set the Frequency Control to 35Hz, and then adjust the Boost Control to your preference. For vented enclosures, set the Frequency Control to 10Hz below the port tuning, then adjust the Boost control to your preference. Sometimes, an amp can be as stylish as it powerful. With brushed steel and screwdriver access concealed by a magnetically attached panel, Kappa amplifiers have a clean, streamlined industrial design.